"Phenomenal tubist Marcus Rojas" (Whitney Balliet, The New Yorker) is a native of New York City. 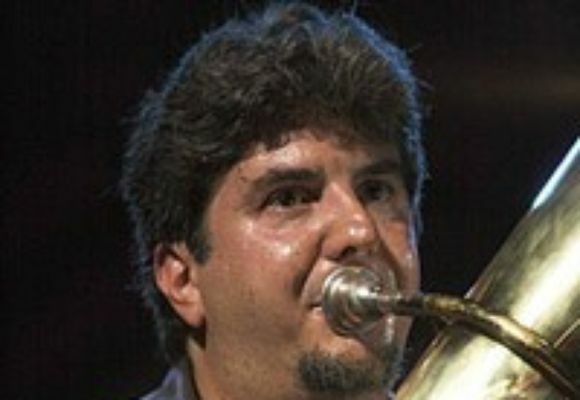 Considered one of "the best all around tuba players in the world" (Harvey Pekar,Jazziz); among the diverse groups in which he has played are the Metropolitan Opera, New York City Ballet, New York City Opera, American Symphony, American Ballet Theater, Joffrey Ballet, Orpheus Chamber Orchestra, the New York Pops, EOS, Radio City Music Hall, Lester Bowie's Brass Fantasy, Charlie Haden's Liberation Music Orchestra, the Art Ensemble of Chicago, Jazz at Lincoln Center with Wynton Marsalis, ensembles led by Gil Evans, George Russell, Jim Hall, Lionel Hampton, Dave Douglas, Wayne Shorter, David Byrne, and P.D.Q. Bach. He has also appeared on the Late Show with David Letterman, The Daily Show with Jon Stewart, the Today Show, Saturday Night Live and The Grammys from New York City. Marcus has played on over three hundred recordings, from CDs of his own groups (Spanish Fly and Les Miserables Brass Band) to Reggae stars Sly and Robbie and the Metropolitan Opera. He has performed and recorded with Michael Jackson, Ray Charles, Paul Simon, Stevie Wonder, Dawn Upshaw, Queen Latifah, Donnie Osmond, Dr. John, Harry Connick Jr., Aretha Franklin, They Might be Giants, and Rosie O'Donell among others. He has recorded for every major film, television and record company in the United States as well as countless commercial jingles and over 60 film scores including Wolf, Interview with the Vampire, Mission to Mars, Muppet Christmas Carol, Ed Wood, You've Got Mail, The Spanish Prisoner, Fargo, Snake Eyes, Primary Colors,101 Dalmations, Shaft, S.W.A.T., American Splendor, Everything is Illuminated and Sleepless in Seattle. He can be heard daily on Nick Jr's. Oswald and the Backyardigans. An avid proponent of contemporary classical and improvised music, he performs solo and duo recitals with flutist Helen Campo, and is a founding member of SingleTree, a trio of flute, tuba and marimba. He was a member of Henry Threadgill's Very Very Circus and has performed the premieres of composers LaMonte Young, Peter Zummo, Gunther Schuller, Ralph Shapey, Philip Johnston, Anne LeBaron, Tom McKinley, Daniel Pinkham, Peter Schickele and John Zorn. New music groups he performs with include Contuum, the SEM Ensemble and the Kamakazi Ground Crew. He did the World Tour of Robert Wilson's Knee Plays. Broadway credits include The Flying Karamotzov Brothers Do the Impossible, State Fair and Candide. Dedicated to giving back so much of what was given to him, Marcus performs over 30 children's concerts and workshops yearly. He has given master classes throughout the U.S., Canada and Europe on topics ranging from Imagination; Creating Your own Musical World, to Why do We Play? and Breathing; How Much is Enough. He is on the faculty of New York University, SUNY Purchase, Brooklyn College and the Manhattan School of Music Precollege Division. Born in Brooklyn, New York,Marcus is a graduate of New York City's famed High School of Music and Art and has a B.M. with distinction from New England Conservatory of Music. His teachers include Bill Stanley, Sam Pilafian, Steve Johns, Toby Hanks and John Swallow.